Today in rūma toru we went to Rehua marae. To get there we travelled on the bus. When we arrived we put our bags down and prepared for the pōwhiri. We went into the wharenui where we listened to Matua Timairiki. We did a waiata to support the people who spoke. 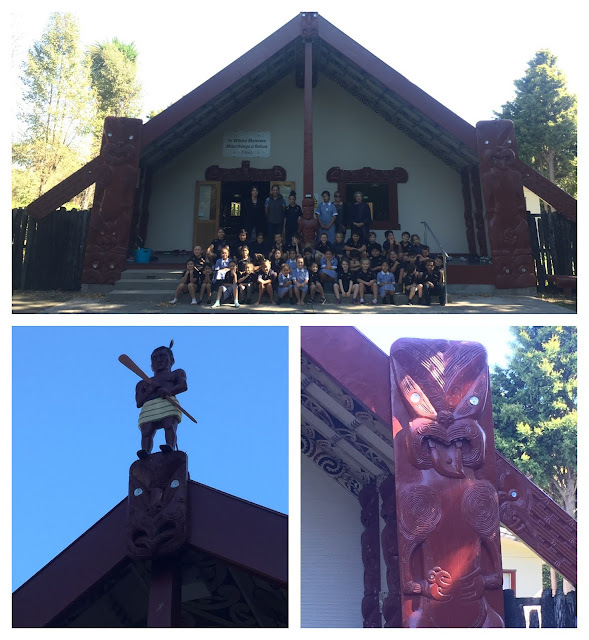 After we had kai we went back into the wharenui and listened to Matua Ritchie talk about the whare and how it got built. - The poupou in the marae represented iwi from around New Zealand. - The whare represented our tūpuna. The whare is a person and we can see the spine and ribs. - Learnt new kupu māori. - Tahu Potiki and his ancestors. - The tūpuna on the walls. After we had tūakana/teina where we drew and talked about our favourite part of the whare. In rūma toru we have been making selfie portraits with Whaea Taylor using multiple medias. We created our backgrounds using watercolours and then our faces with oil pastels. After we finished we made padlet about things that challenged us, things that we learnt and things that we enjoyed about this process. This morning we had the pleasure of welcoming a group of students from Sonoda Women's University and their teachers to the school. Alyssa welcomed them and we did a waiata to support her. Then we broke into groups and the Japanese students read us picture books that they had translated into English of very old traditional Japanese fables. Last week we learnt about Tāne Whakapiripiri and what he represents. We learnt that he is the atua of the buildings that provide shelter to bring people together. In Winter he works harder because the buildings keep people warm. Ruma 3 2019 Who are we? Kia ora koutou, nau mai haere mai ki tēnei rangitaki. This year we have got an amazing class of 26 akonga and an fantastic teacher called Whaea Heather. We are from Year 4 to Year 6 and come from all over Aotearoa, from the Far North to Bluff. We are a special class because we speak te reo Māori and we also learn about tikanga māori. We are into football, rugby, swimming, chromebooks, te reo māori, touch, netball, gaming, league, basketball, art, pāngarau, building and constructing, whānau, eating, kapahaka and heaps more. We are a digital 1:1 classroom and we use our chromebooks everyday. We love to Learn, Create and Share everything we do. Please follow our blog to see what is going on in our amazing classroom. WALT float on our backs. Today Ruma 3 enjoyed the swimming pool and we were all able to float on our backs. Whaea Heather was really pleased with our progress. It was a nice way to cool down as well. Today we read the book The Tree Hut Treaty written by Wiremu Grace. After discussing it we realised that we could all contribute ideas to create our own classroom treaty. We worked in groups brainstorming our ideas of things that are important for our classroom to be a safe and happy place for learning and then we shared them. Next week we will write up our new classroom treaty. Here are the iwi that our class whakapapa to hõtõ. Some tamariki were chosen to place the special white crosses on our lawn. We have completed our work on Peru and have shared it at assembly. Reflecting on our stay at the marae. We finished off our lanterns today. After putting wire handles on them we dropped a tea light candle inside ready to light.